A Blog Of Ice Cream: Animals Love Ice Cream Too! We know that humans love ice cream - but what about animals? I already knew from my own experience as a child that dogs love ice cream (not that it's good for them to eat too much of course) because my Yorkshire Terrier Josie and I would often share an ice cream cone together - I would eat the main part and break the bottom off for her as a mini cone with a little scoop of the ice cream in it! 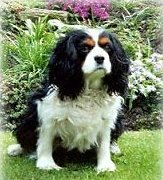 My Mum's pet Cavalier King Charles Spaniel, Holly, also had a great fondness for ice cream and a friend once told me about her cat having the same passion .. but what about other animals? I decided to do some research and was amazed at what I found. There are clearly many, many people whose pets love ice cream; from dogs of all kinds and sizes to cats but also rabbits, horses and even birds! Not only that, but the way in which these animals eat ice cream varies enormously. Some cats refuse to eat ice cream directly and insist on using a paw to scoop it up - a bit like when we humans use a plastic ice cream spoon to eat out of an ice cream tub! I came across some great video clips of animals eating ice cream, some of which are really delightful and funny - if you're interested in looking at them there's a dedicated page on ice-cream-recipes.com called animals eating ice cream.